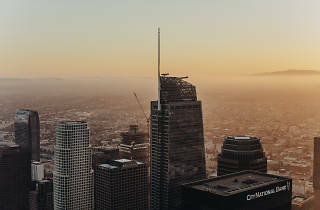 The brand-new billion-dollar-plus skyscraper that's been gracing the beautiful Los Angeles skyline is finally open, and the Wilshire Grand spares no expense when it comes to wowing its visitors with stunning views, gorgeous interiors, plenty of dining choices and—in all seriousness, the best part—the most extravagant bathrooms we've ever seen in L.A.
Take the Marie Antoinette-themed, gold-accented women's bathroom on the 71st floor of the InterContinental Los Angeles Downtown, which occupies floors 31 and up. The corridor mimics the hallways of Versailles with wallpapered doors, intricately-patterned lounge chairs (perfect for when you've had too much to eat) and some modern light fixtures to top it all off. All photographs by Rozette Rago unless otherwise stated. The men's bathroom on the 71st floor is no joke either. Feel like a fancy cowboy as you stop by the ivory-colored urinals while served with either the mural on one side or an overview of Downtown Los Angeles on the other. Relieving yourself has never been so exciting. But wait until you get to the men's bathroom on the hotel lobby floor. Enter through the door by the neon "M" sign and into the future as you step in front of a glass waterfall urinal. This never-before-seen creation has already started a social media fanfare and will undoubtedly remain one of the building's most popular "attractions". Of course, the wow factor doesn't end with its one-of-a-kind bathrooms. The InterContinental Hotel lobby is situated on top the city at the 70th floor, giving guests a great view of the L.A. Basin and ongoing traffic below. That's exactly what inspired the giant light fixture hanging above the entire check-in area made from actual car headlights and tail lights. Its intersecting lines are fashioned after the intersecting freeway lanes seen from the lobby windows. The hotel is positioning itself as a top destination for people looking to impress their dates with fine cuisine and meticulous design details. La Boucherie is a beautifully designed steakhouse that's friendly to both group diners with its large wooden block tables, as well as first dates and anniversaries with the romantic and private booths staring straight out of the glass windows. Dekkadance on the 69th floor is a more casual, cafeteria-style experience. On the same floor as well is Sora, a sushi spot with a conveyor belt rotating the goods around. The pool area on the seventh floor has an adorably named No Dive Bar designed as a pool upside down. 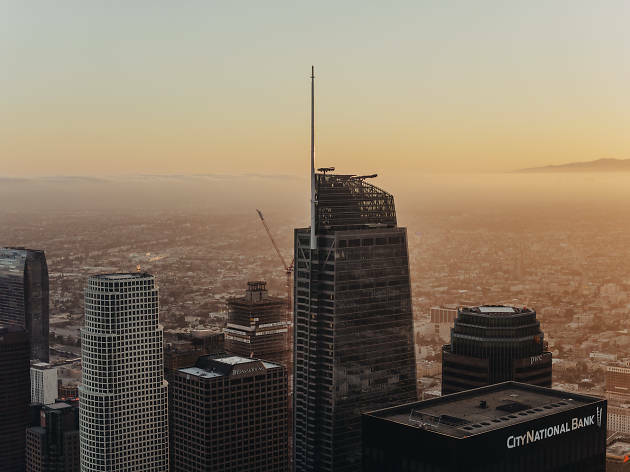 Finally, the Wilshire Grand's crowning glory is arguably Spire 73, the tallest open-air bar in the country atop the 73rd floor. It's a huge space with plenty of outdoor seating and fire pits for when it gets chilly at night (and when you're that high up, it surely will). Expect this to be one of the city's newest nightlife hotspots, with July reservations already filling up. Welcome to the skyline, Wilshire Grand. Nice to have you here.